About 90 percent of the time that I’m on the Web (to use a number I picked out of thin air), I’m searching for something. But while I usually turn to Google, my search engine of choice, there are times that I want to search a specific site—say, IMDB or Wikipedia. It seems like a waste time to have to go to the desired site, find its search box, and type my search query. Luckily, I can do all that right off the bat with the help of third-party software. Safari Keyword Search is an extension for Safari 5.1 or later that mimics a feature found in Chrome and Firefox: You can define keywords that allow you to search particular sites right from Safari’s unified URL/search field. The extension is free, though the developer requests a donation if you find it useful. For example, say I want to look up some information about the actor Sean Connery. I could type his name into Safari’s search bar, wait for Google to load the results, and then click on the Wikipedia page for Sean Connery (which would presumably show up near the top of the hits). Or I could simply type “w Sean Connery” into the URL field, and be taken right to his Wikipedia page. (W is Safari Keyword Search’s abbreviation for a Wikipedia search.) It’s speedy, unobtrusive, and efficient. 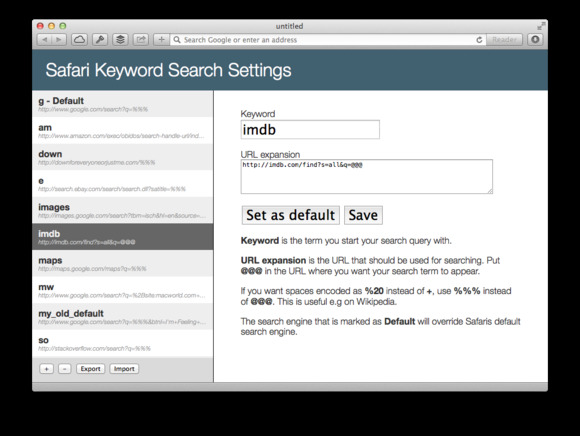 Safari Keyword Search comes preloaded with a dozen keywords for popular sites, including Wikipedia, IMDB, Amazon, Wolfram Alpha, YouTube, and eBay. But you can also create your own shortcuts by finding and isolating the search string for any site. 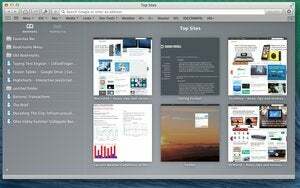 For example, I’ve created a shortcut (mw) that performs a Google search that’s restricted to the Macworld.com website. You create those shortcuts in Safari Keyword Search’s settings screen, which is accessed by right-clicking (Control-clicking) anywhere on a webpage and choosing Keyword Search Settings from the resulting menu. In this screen, you can add, remove, or edit your existing shortcuts. You can even set one of your shortcuts to be Safari’s default search—the search that occurs whenever you type a search term into Safari’s unified search/URL field without using a shortcut. This is a handy feature if you’d like Safari to default to a search engine other than the few options provided by Apple. Overall, Safari Keyword Search is one of those great pieces of software that enhances your daily routine while staying out of your way unless you want it. Even better, it won’t cost you a dime (unless you admirably decide to donate). After using it for a while, my only problem is sitting down at a Mac that doesn’t have it installed. The Safari Keyword Search is a browser extension that lets you search a variety of sites right from Safari's unified search field.